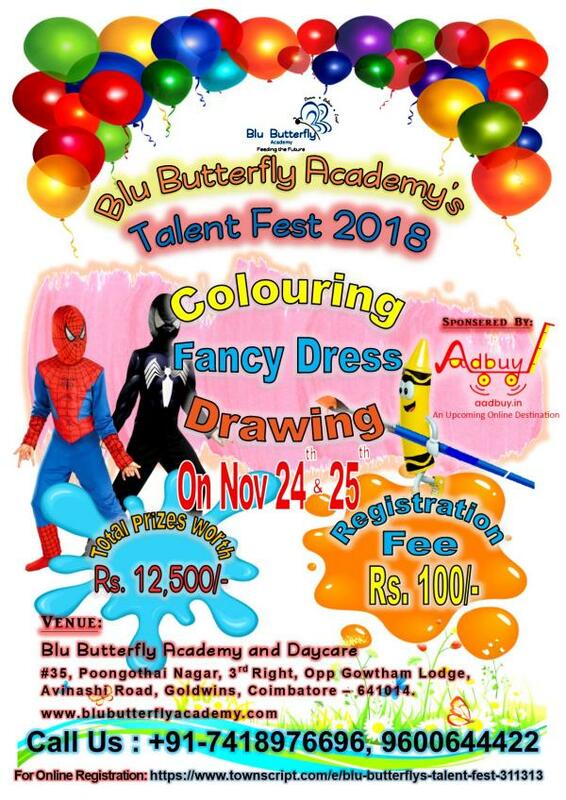 Blu Butterfly’s Talent Fest 2018: Drawing Competition, Coloring Competition, Fancy Dress Competition on November 24 and 25, 2018. Join us to explore your kid’s talent and get them rewarded for their creativity and build their confidence. #35, Poongothai Nagar, 3rd Right, Opp Gowtham Lodge, Avinashi Road, Goldwins, Coimbatore – 641014. 1. Participants should bring their School ID card. 3. The judgment by the panel of experts will be final. 4. 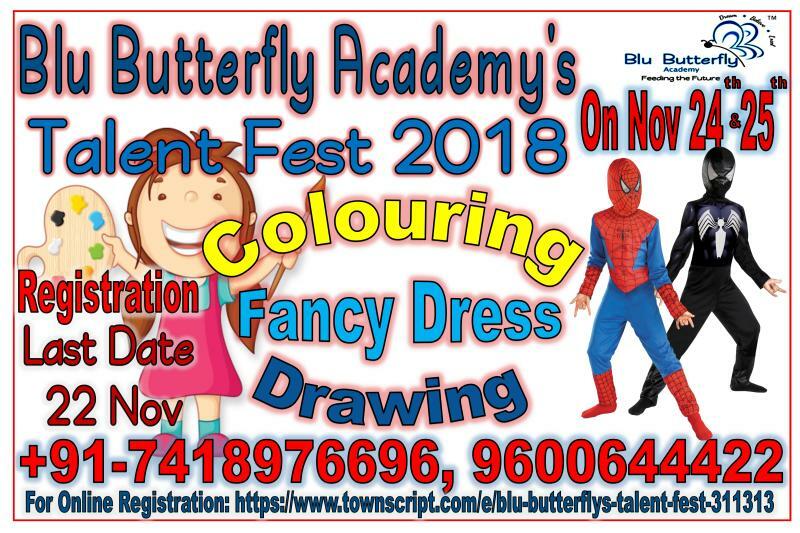 Result will be announced to the winners on 25th November 2018 through phone. 5. Prize will be distributed to the winners on 25th November 2018 evening. 6. Please Share your contact details while booking online so that we can contact you for sharing the Time slot for the Competition. 7. Online Registration costs Rs.20 extra (total Rs. 120/-) than Booking in person at venue before 22-11-2018. 9. While coming to competition, Please bring soft copy of the email/online ticket booked here. 1. All participants will be provided with A3 white paper. intimated on or before 21 st November. 3. Participants have to bring their own colors, Pencils, writing pad & other materials required. Note: Category 1: Only Crayons or Pencil Colours need to be used. 1. Participant can choose desired costume/ character. 2. Each participant should deliver a short narration on his or her character. 3. Participant should adhere to a maximum time limit of 2 mins including narration. 4. Only solo performance is allowed. 5. 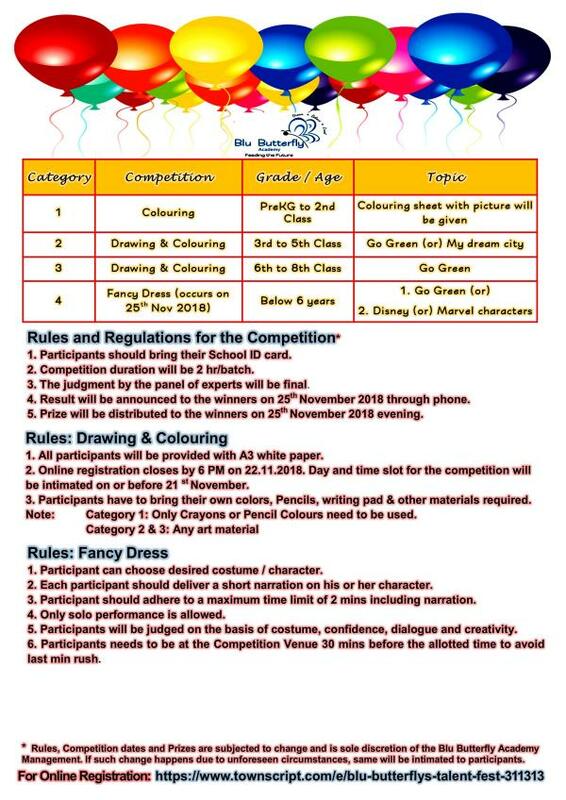 Participants will be judged on the basis of costume, confidence, dialogue and creativity. 2. Winners will get Cash Prize, Medal or Certificate. 3. All participants get Certification of Participation. *Rules and Prizes are subjected to change and is sole discretion of the Blu Butterfly Academy Management.